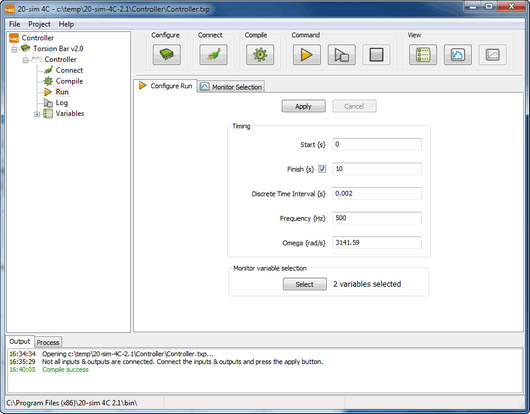 After the compilation step, the Run button is still orange which means that 20-sim 4C needs additional configuration information for the run before it can run the model on the selected target. Click on the orange Run button to select the Configure Run tab to configure the run-time settings. •The Finish time of your model: You can either choose to set a finish time by checking the check box or uncheck the check box for long time run. •The sample frequency (change the Discrete Time Interval, the Frequency or Omega). Specify how long the model should run at which rate. Click the Apply button after the settings have been checked and/or altered. The Run button will change from orange into green . The first of the Command buttons is Run button . If you click the Run button the model is transferred to the target and starts running. The Run button changes to grey and is disabled. The Stop button will now become active and green and you can click it to stop the running model. Furthermore, the Variables view will be opened where you can inspect the actual values of inputs, outputs, parameters and variables of the running model. Use the Run, Log and Stop buttons to control the model running on a target. The second button of the Command buttons is Run with Logging button . If the button is orange the logger needs to be configured. Pressing the button will automatically open the logger configuration tab. If the button is green the model is transferred to the target and logging is started. After the logging has completed a data file is written to disk and depending on the configuration a plot will be shown. For more information on Logging see Monitoring and Logging. You can use the Stop button to stop a running model.